Work is progressing on this piece entitled Raven’s Voice, created for Seattle’s Rainier Club. It has yet to receive a patina, but measures 24” high and 30” across. It will stand at seven feet above the lobby floor, facing the entry doors. The work is intended to be a metaphor, consistent with Pacific Northwest First Nation Traditions, believing that the Raven speaks on behalf of all nature and that it is wise to consider his/her wisdom. Angell’s work will be featured in “Living Legends: Discovering the Masters of Wildlife Art” exhibition on display at the National Museum of Wildlife Art, in Jackson Hole, Wyoming. The exhibition will be on display through April 14, 2019. Each of the thirty nine artists included in this show have played an important role over the years of the Museum’s development. The exhibition honors not only this relationship, but also highlights each artist’s ability to capture the essence of the Museum’s mission to collect the highest quality wildlife art. Tony is honored to be named as The Rainier Club's 2018 Laureate, an award given to honor a creative professional with ties to the Pacific Northwest. Other distinguished laureates include Timothy Egan, Tom Robbins, and Dale Chihuly, among others. "For more than half a century, Tony Angell has responded to the powerful presence of nature in the Pacific Northwest — in his artistic forms, and written and spoken words. 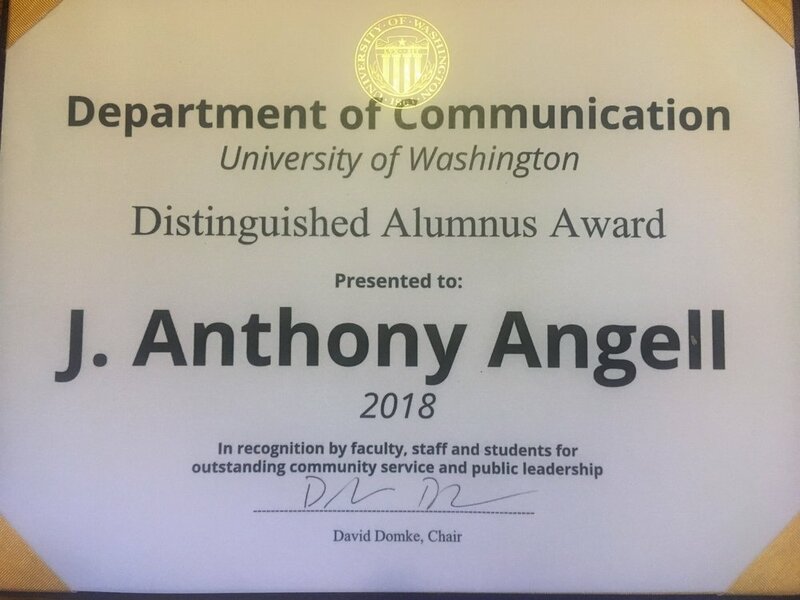 Angell was named a University of Washington Department of Communications Distinguished Alumnus. Thank you! On June 7, Tony gave the commencement speech for the University of Washington Department of Communications 2018 graduating class. It was an immense honor. Watch the full commencement speech below. ... which was finally installed this month! See it in person on the Seattle University campus.